Incorporating DNA testing into the diagnostic testing cycle for cancer confirms patient identity and sample purity significantly reducing the opportunity for adverse outcomes due to Specimen Provenance Complications (SPCs), switching and contamination errors. Strand uses DNA Specimen Provenance Assay (DSPA) to match the DNA profiles of a patient’s self-identified cheek swab to the cancerous biopsy tissue to rule out the possibility of specimen contamination (i.e. confirm sample purity) and confirm the tissue belongs exclusively to the patient being evaluated. While DNA testing is most commonly performed in forensic laboratories for the purpose of crime scene analysis and/or parentage, numerous researchers have acknowledged the potential benefits of leveraging this proven technology in the healthcare setting. • The American Journal of Clinical Pathology documented the rate of occult SPC occurrence and demonstrated the utility of DNA-based testing to detect the errors not captured by current laboratory protocols. This study3 found that up to 3.5% of biopsy specimens being evaluated may not belong exclusively to the patient being diagnosed, whether by specimen contamination or patient misidentification errors. By incorporating DNA Specimen Provenance Assay testing into the standard process for collecting and evaluating biopsies, patient safety can be improved through the identification of otherwise undetected specimen provenance errors that can lead to unnecessary medical interventions and/or delayed treatment. • As published by The Journal of Urology the social and economic burden of healthcare expenditures associated with this SPC error rate data exceeded $8804 million annually and further concluded that 1 in 200 prostate biopsy patients are affected by specimen contamination or patient misidentification errors. • Clinically significant admixtures5 (specimens with greater than 5% DNA contamination of another source) were recognized by the authors of a Washington University study as published in the American Journal of Clinical Pathology. The findings determined that 2% of the next-generation sequencing samples evaluated were so significantly contaminated by another’s DNA that the biomarker test results were confounded. DNA Specimen Provenance Assay (DSPA), DNA testing, as part of the know error® system is increasingly becoming the standard of care to complete the diagnostic testing cycle for cancer, providing patients and physicians with a complete diagnosis to proceed with the personalized therapy for the appropriate patient. 1. Suba EJ, Pfeifer JD, Raab SS. Patient identification error among prostate needle core biopsy specimens–are we ready for a DNA time-out? J Urol. 2007;178:1245-1248. 2. Marberger M, McConnell JD, Fowler I, et al. Biopsy misidentification identified by DNA profiling in multicenter trial. J Clin Oncol. 2011; 29(13): 1744-1749. 3. Pfeifer JD, Liu J. Rate of occult specimen provenance complications in routine clinical practice. Am J Clin Path. 2013;139(1):93-100. 5. Sehn JK, Spenser DH, Pfeifer JD, et al. Occult specimen contamination in routine clinical next-general sequencing testing. Am J Clin Path. Oct 2015;144:667-674. Very specific locations (loci) in the DNA are copied (amplified) millions of times; each copy has a fluorescent tag attached. This amplification process is very sensitive. 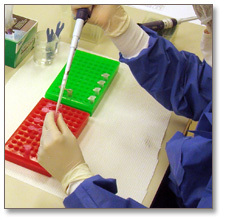 If non-patient DNA is present, for example, from extraneous tissue in the water bath or from a cutting station that is not cleaned between samples, the non-patient DNA will be amplified along with the patient DNA, and readily discernable in our test result—even if the foreign cells are not distinguishable under microspic examination.